Running the Western States Endurance Run has been a dream of mine since I first learned about the race and ultra running in 2007. I've tried to get into the race via the lottery for the past 3 years, and this year was the second attempt to gain entry into WS via a MUC qualifying race - both being the Ice Age Trail 50. 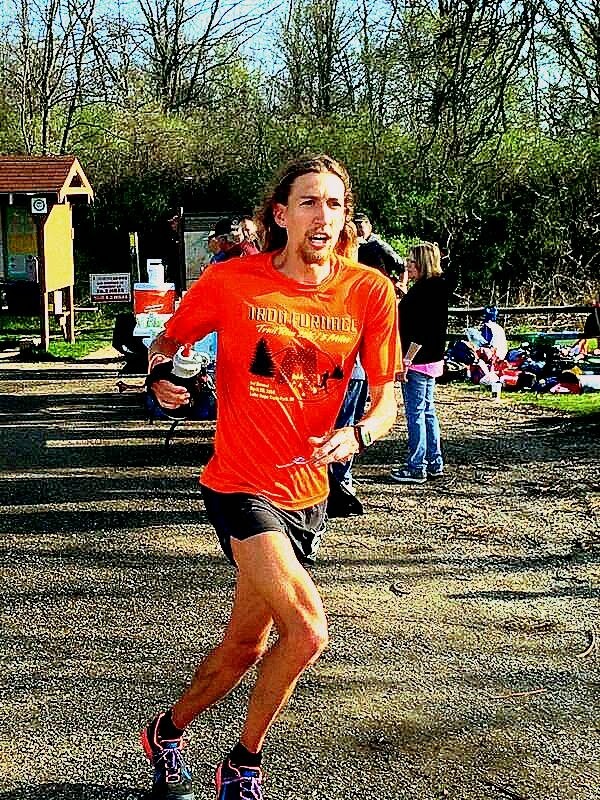 To make what will be a long story short, I finished 4th in this years Ice Age 50 and exactly 92 seconds behind 3rd place and an entry to Western States. 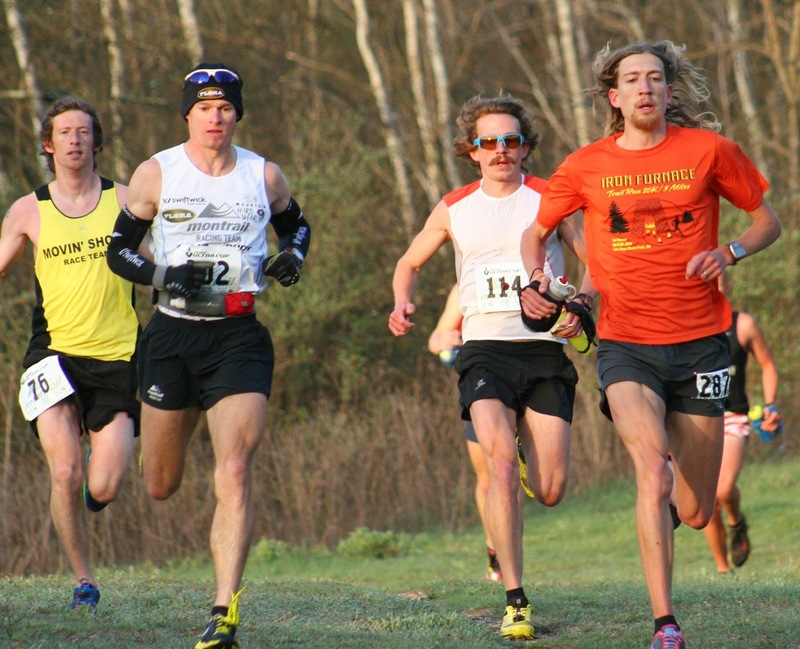 Although I am disappointed I won't be toeing the line on June 28th in Squaw Valley, let's focus on what was a great day of racing at the 2014 Ice Age Trail 50! A bunch of Ohio folks in Wisconsin. "Better watch out." After a long wait in the bathroom line, I had just enough time to tie my shoes and make it to the starting line. My goal for this race was to race. 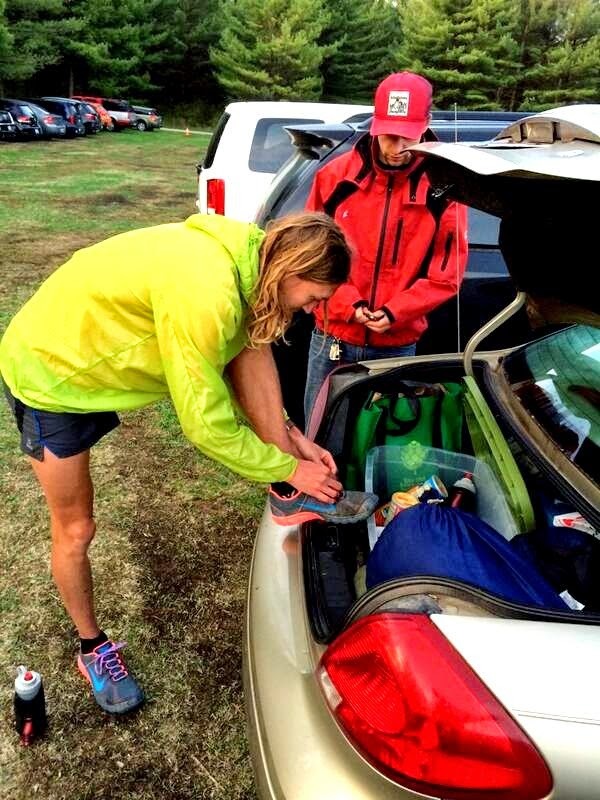 I've competed in 11 ultras now, and it is strange that I have never really entered one with a "race" mentality. Usually it is more of a "persevere" or "get to the finish" sort of mindset. However, with ultra running getting more competitive with deeper race fields, and loftier goals and ambitions for myself, I really wanted to go into this with the ability to "race" the latter part of the race. If this meant going harder in the earlier parts of the race, it was what I was ready to do, and I hoped that if a scenario presented itself in the last 10 miles of the race, I'd be able to at least have some fight in me. I was also very confident with my training, with 13 weeks of 100+ mile weeks coming into Ice Age, including more "speed work" than I've done in the past 3-4 years. As expected, the race started out fast. With Ice Age being a part of the MUC series, there are normally a contingent of guys and gals vying for the last few spots for Western States; as noted I was one of those guys. Ice Age's super stout course record set by Andy Jones in 1988 had also formed this allure for folks coming and trying to run faster, and many had failed trying over the 25 years. With speedy guys like Max King, Matt Flaherty, Zach Bitter, Joe Uhan, Matt Laye, etc., I knew it was going to be fast on the opening 9 mile Nordic Ski Loop. Shortly into this loop, a front pack had formed but a few were separating even further ahead. Without really consciously thinking about it, I made a move to join that front pack ahead. That decision changed the entire outcome of the race for me. Early in the race near mile 5. This would end up being the top 4 finishers, left to right, Brian Condon for 3rd, Max King for 1st, Matt Flaherty for 3rd, and myself for 4th. Photo by former IAT50 RD John Zinzow. Okay, so great. 6:20 pace for the first 9 mile loop. I was happy at this point to be in the front pack - however, I won't lie and say that there wasn't some doubt in my mind about the fast pace. I've never started out this fast in an ultra, let alone carry a sub 6:30 mile through a significant portion of a 50 mile race. Typically, I would be further back relying on some of the top gunners to fade later or drop out. I quickly knocked out some bad thoughts about falling apart later and joined the singletrack Ice Age Trail following Brian Condon, Matt, and Max. I figured the pace would slow as the Ice Age Trail is tight, semi-technical, and a bit turny. However, the pace started to quicken even more. Not sure what I am saying here but the race was getting intense. Trying to keep the 6:30's rolling. Once we entered the trails the miles continued to stay in the mid 6 minute range with a couple even being below 6. Some of the more hillier miles were over 7, but the four of us continued to push hard. It is crazy that even in these fast miles Brian, Matt, and Max pulled away from me a bit. I could still see them on the straights, but the fast pace was a little hard for me to maintain on the technical trails. Once a section opened up, I felt like I was able to keep even with them still. 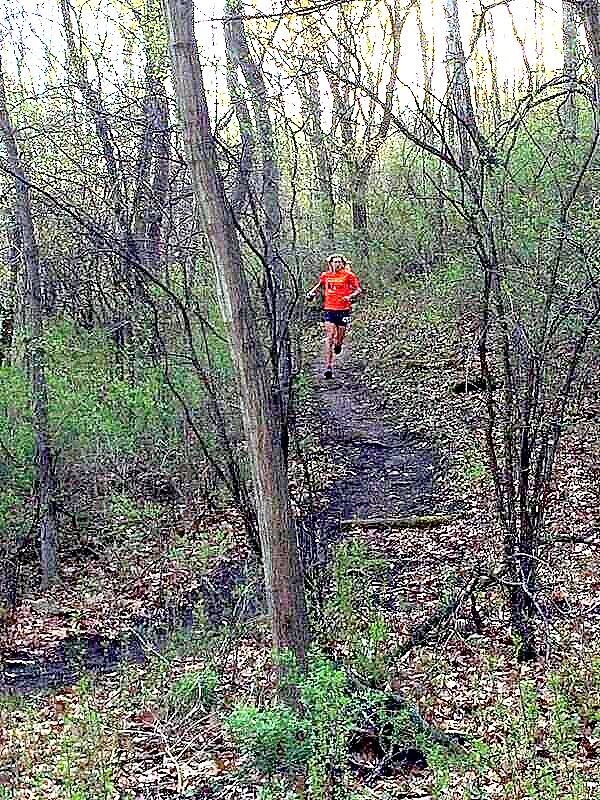 Sadly, I noticed my technical trail running ability was lacking compared to my competitors. This was only a problem in keeping with them during the middle section of this race, as I think this technical ability sort of evens out when fatigue starts to set in. Matt stopped to water the flowers and I was able to hook up with him until the turnaround at Rice Lake (21.7 mi.). He shot by me at this point and I was never with him again. At the Rice Lake turnaround - as Matt heads out I head in. I never catch back up to him. Now I was in no mans land and could not see the three guys in front of me. I could tell based on seeing the guys behind me on the out and back that I was over a mile ahead of fifth place, so I knew our fast pace was a surprise to the rest of the the viable contenders. Now it was just a question of whether or not any of us would be coming back. At this point, I thought maybe that guy would be me. I ran alone through Highway 12 at the Marathon portion and was told I was 3-4 minutes back on the leaders. They must have maintained sub 7 miles when I was waning a bit. Regardless, I was happy with my time and knew that we were well under course record pace. My halfway split would have put me at just over 5:30, which would have been 20 minutes under the course record. This gave a lot of wiggle room, but I knew the 8 mile out and back section to Emma Carlin was much more hilly and technical than the first part of the course. Sweet singletrack on the Ice Age Trail. From Highway 12 and past the halfway point I continued to run alone before heading into the last out and back section starting at mile 32. Based on my 6 miles (splits below) during this stretch, it is easy to see I was starting to waver and see some slower miles. My first 8+ minute mile came at mile 29 and I continued to try to stay focused. One interesting dilemma during the race that I encountered was that my appetite was lacking completely. 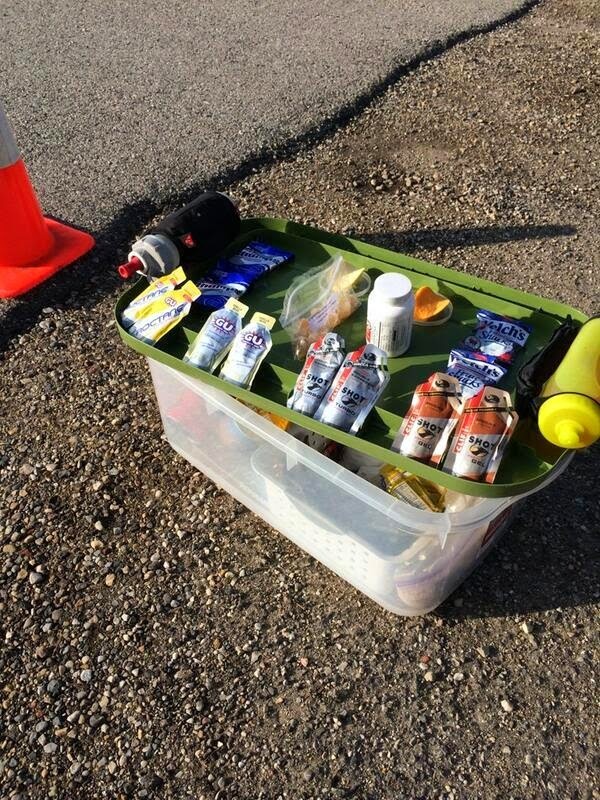 Normally I eat a lot during ultras and I don't have problems with gels or water, or anything I throw in the system. It wasn't like my stomach was refusing what I ate, but for whatever reason nothing seemed good and I wasn't hungry. 25 miles into the race I had only 2 gels and two handfuls of Pringles. 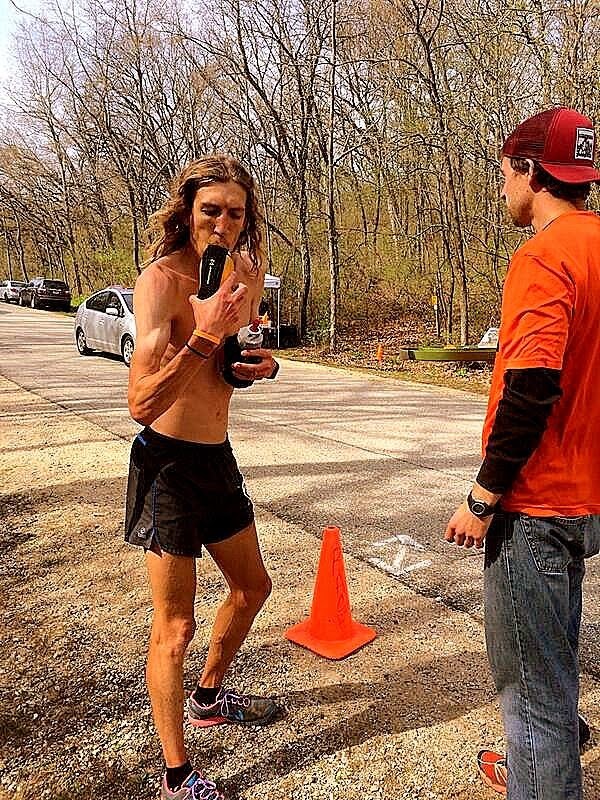 At one aid station I grabbed a stack of Pringles and still had them in my hand at the aid station 2.5 miles later. I just couldn't bring myself to stick them in my mouth. Gels were the same way, being opened in my hand and running a couple miles before finally sucking them down. Trying to get some Gatorade in me. Drank and ate too little during the race. Entering the out and back to Emma Carlin, I got word that Max and Matt were pulling away from Brian and that I was only about 2 minutes behind 3rd. This gave me a jolt of adrenaline and I pushed hard knowing that a Western States spot was within grasps. Even though I pushed so hard on this 8 mile section before turning around, I never even caught a glimpse of Brian. At another aid station I was told I was 45 seconds behind. The demons crossed my mind from 2012 - this is the section that broke me at Ice Age last time with a lot of walking and bonking. I had to escape these thoughts and trust that this year I was in better fitness. I was able to see how far back I was from Max and Matt on the out and back and as I got closer and closer to the turnaround, I wondered when I would see Brian. 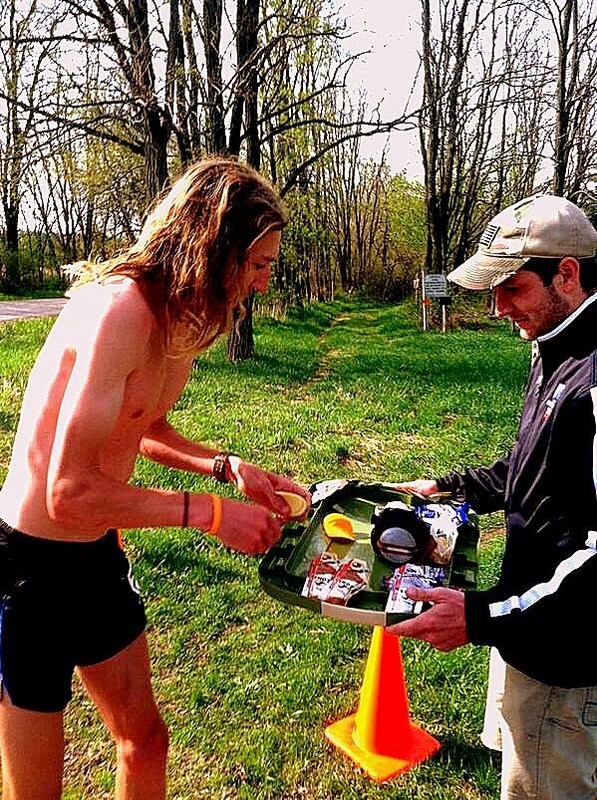 It wasn't until I entered the field to the aid station that I saw him leaving. It was a race - I was just seconds behind! Soon after the turnaround at mile 40 I caught Brian and could tell I was feeling better than he was. I knew I had to have been moving faster than him since I rolled up on him and had to slow down. He powerhiked a couple steeper uphills while I jaunted behind feeling good. I thought that I was saving energy and would wait to make my move. Looking back, this was a mistake - I should have gone by him when I was feeling the best. The roles soon reversed. After running with Brian for 5 miles my calves suddenly became sore and tight and I watched as he pulled away on one longer uphill. I was still entirely focused and I yelled at myself out loud to fight through it and not let him get away. As much as I pushed, at mile 45 or so, I lost sight of him and ultimately the position for a Western States spot. I have to give big props to Brian for being a strong runner and competitor. I'm not sure how he was feeling when I caught him but he dug deep and held me off. As I ended the hilly singletrack section and approached the last 1.5 mile section of smooth trail, my legs came out of their despair and I pushed hard to the finish. I thought if I could try to through down a quick last mile and Brian would be bonking, I might have a chance to get him. But, he must have finished strong because he beat me by 92 seconds. It was strange finishing the last mile - I only ran a 6:58 but it strangely felt the easiest 7 minute mile of the entire day. I officially crossed the line in 5:59:56 in 4th place. I'm really happy and pleased to break 6 hours - prior to this year only 5 other runners had broke 6 hours in the 32 year history of the Ice Age Trail 50. This year 4 broke the mark. I told people leading up to the race that if I was able to break 6 hours somehow I would be a lock for the Western States spot and maybe 1st place. To be a part of the fast Ice Age ever is cool. 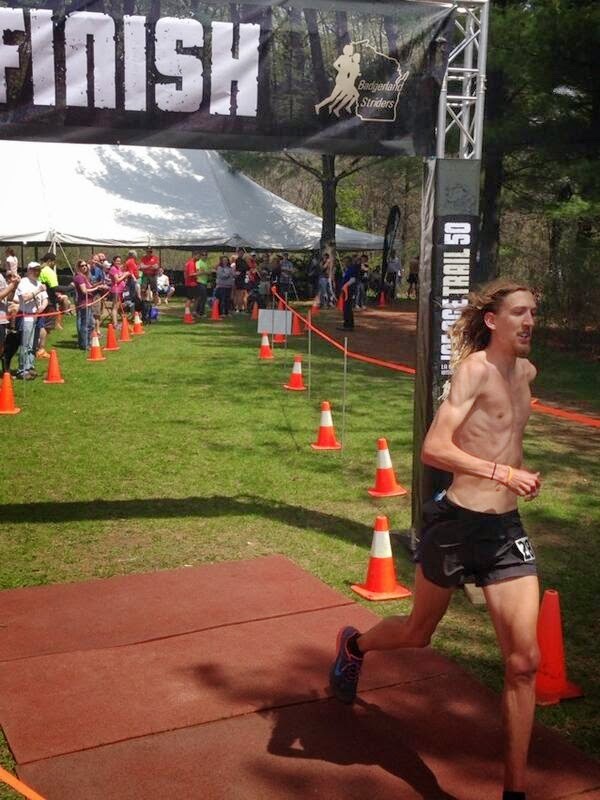 Max King crushed the course record by over 12 minutes and Matt Flaherty also came in under the 25 year CR. So even though I was 92 seconds from a Western States spot, I am entirely pleased with my performance. I put myself in a great position to be able to race at the end. I just wasn't quite the top 3 strongest runners on that particular day. Normally a race with such a fast start would see more fading at the end, but all four of us stayed strong. I PR'd in the 50K en route by over 34 minutes and gained some great confidence and experience in faster races on this terrain. I felt strength from the support and cheers from back home in Ohio throughout the entire race. One of my weaknesses is that I get emotional during races. This can be a bad thing sometimes but I've learned to harness the emotion in a productive way. I get choked up for moments during almost all longer ultra's I've ran, and this energy helps fuel my performance! Knowing my wife, family, and friends are back home supporting my adventures is sometimes what gets me through the low patches. My crew was great and I'll hand them the best crew award for the day. I probably stopped for less than 1 minute combined over the entire race. 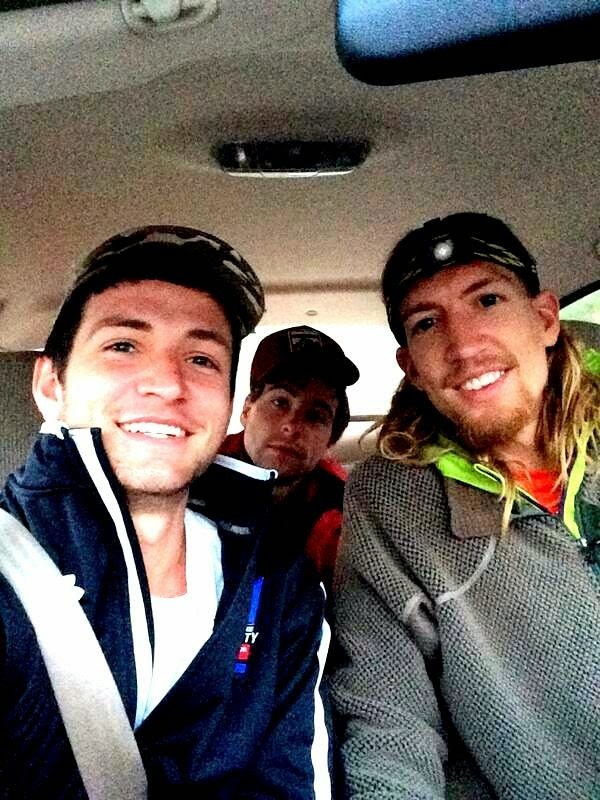 Adam Stumbo and Kameron Starr, both first time at crewing for an ultra, was on the ball at every aid station. They used creative ways to get me food and drinks and was in perfect position where I was able to just grab and go. Thanks you two! Ultra-buffet - all the essentials that I needed. Grabbing the Pringles, my go to source of salt in the form of real foods. Grab and go, less than 5 second pit-stops. Also a big thanks to Race Director Jeff Mallach for letting me get in the race late and for organizing such a top-notch event. 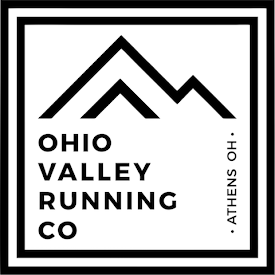 As a new Race Director myself, I am even more appreciative of the effort race organizers put in and notice all the small details and behind the scenes work they do. It was a great experience. The many volunteers and workers were awesome and encouraging as well! I was following the race on iRunFar and rooting for you from Wales. Sounds like it was a bitter-sweet day, but hopefully time will make the bitter part fade away. I am sure you will get your WS spot, if you keep at it. Hope our paths will cross again some day. Happy trails! 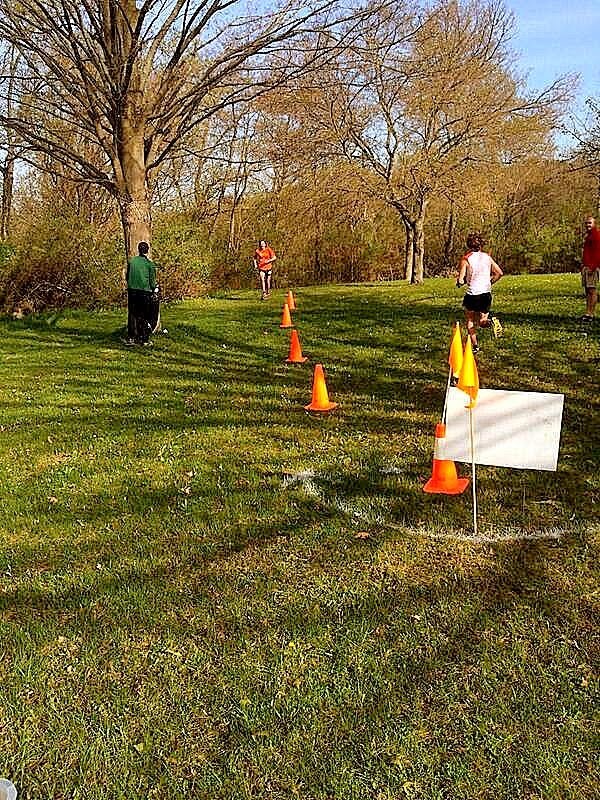 Awesome report and great to see you run at Cayuga. I love this sport and the way "unknowns" like yourself and Tristan show up and do damage. 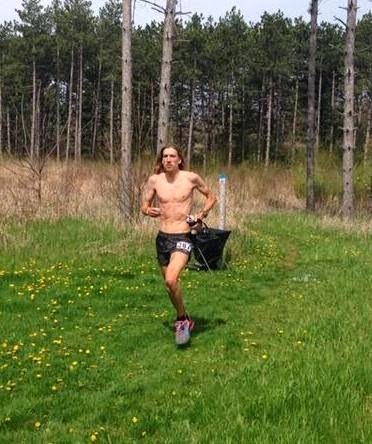 I did see you warming up the day before at the campground and I was like "WHO IS THAT GUY?"